“An object remains in its state of rest or in motion until and unless acted upon by an external force” Newton’s first law of motion, this law by Sir Isaac Newton gave rise to the development of braking system in an automobile, developing an automobile vehicle not only requires the power source but also the efficient braking system as higher the horse power higher will be the brake force required to stop or de accelerate that vehicle. This thought gave rise to many researches in the field of braking and results in its evolution due to which today we have flexibility in choosing a suitable braking system according to our need. So let’s just start our article with the curiosity about the various types of braking system. In an automobile vehicle, a braking system is an arrangement of various linkages and components (brake lines or mechanical linkages, brake drum or brake disc , master cylinder or fulcrums etc) that are arranged in such a fashion that it converts the vehicle’s kinetic energy into the heat energy which in turn stops or de accelerate the vehicle. The conversion of kinetic energy into heat energy is a function of frictional force generated by the frictional contact between brake shoes and moving drum or disc of a braking system. To stop the moving vehicle. To de accelerate the moving vehicle. For stable parking of a vehicle either on a flat surface or on a slope. As a precaution for accidents. To prevent the vehicle from any damage due to road conditions. Drum Brakes vs Disc Brakes – Which is Better? It is the type of braking system in which the brake force applied by the driver on the brake pedal is transferred to the final brake drum or disc rotor through the various mechanical linkages like cylindrical rods, fulcrums, springs etc. In order to de accelerate or stop the vehicle. 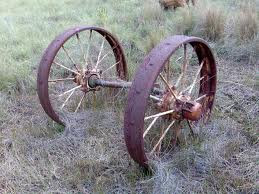 Mechanical brakes were used in various old automobile vehicles but they are obsolete now days due to their less effectiveness. It is the type of braking system in which the brake force applied by the driver on brake pedal is first converted into hydraulic pressure by master cylinder (for reference read article on master cylinder) than this hydraulic pressure from master cylinder is transferred to the final brake drum or disc rotor through brake lines. 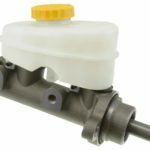 Instead of mechanical linkages, brake fluid is used in hydraulic brakes for the transmission of brake pedal force in order to stop or de accelerates the vehicle. Almost all the bikes and cars on the road today are equipped with the hydraulic braking system due to it high effectiveness and high brake force generating capability. 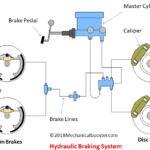 It is the types of braking system in which atmospheric air through compressors and valves is used to transmit brake pedal force from brake pedal to the final drum or disc rotor. Air brakes are mainly used in heavy vehicles like busses and trucks because hydraulic brakes fails to transmit high brake force through greater distance and also pneumatic brakes generates higher brake force than hydraulic brake which is the need of the heavy vehicle. The chances of brake failure is less in case of pneumatic brakes as they are usually equipped with a reserve air tank which comes in action when there is a brake failure due to leakage in brake lines. High end cars these days are using air brakes system due to its effectiveness and fail proof ability. It is the conventional type of braking system in which vacuum inside the brake lines causes brake pads to move which in turn finally stops or de accelerate the vehicle. Vacuum brakes were used in old or conventional trains and are replaced with air brakes now days because of its less effectiveness and slow braking. Vacuum brakes are cheaper than air brakes but are less safe than air brakes. In this types of braking system, the magnetic field generated by permanent magnets is used to cause the braking of the vehicle. It works on the principle that when we pass a magnet through a cooper tube, eddy current is generated and the magnetic field generated by this eddy current provide magnetic braking. This is the friction less braking system thus there is less or no wear and tear. This is the advanced technology in which no pressure is needed to cause braking. The response to the braking in this is quite quick as compared to other braking systems. (i) Plugging Brakes-When the brake pedal is pressed in the electric vehicle equipped with plugging braking, the polarity of the motors changes which in turn reverses the direction of the motor and causes the braking. (ii) Regenerative Braking- It is the type of electrical braking in which at the time of braking the motor which is the main power source of the vehicle becomes the generator i.e. when brakes are applied, the power supply to the motor cuts off due to which the mechanical energy from the wheels becomes the rotating force for the motor which in turn converts this mechanical energy into the electric energy which is further stored in the battery. Regenerative braking saves the energy and are widely used in today’s electric vehicles. Tesla Model-S provides the most effective regenerative braking. (iii) Dynamic or Rheostat Braking- It is the type of electrical braking in which resistance provided by the rheostat causes the actual braking, in this type a rheostat is attached to the circuit that provides the resistance to the motor which is responsible for de acceleration or stopping of the vehicle. 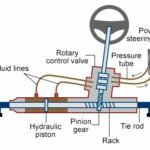 How Suspension System Works in Automobile? It is the type of brake system in which a drum which is the housing of the brake shoes along with actuation mechanism is attached with the wheel hub in such a fashion that the outer part of the drum rotates with the wheel and inner part remains constant. When brakes are applied the actuating mechanism (wheel cylinder or mechanical linkage.) causes the brake shoes to expand due to which the outer frictional surface of the brake shoes makes frictional contact with the rotating drum part which in turn stops or de accelerate the vehicle. It is the types of braking system in which instead of a drum assembly a disc rotor attached to the hub of the wheel in such a fashion that it rotates with the wheel, this disc rotor is clamped in between the caliper which is rigidly fixed with the knuckle or upright of the vehicle. This caliper used is the housing of the brake shoes along with the actuation mechanism (mechanical linkages or caliper cylinder). When the brakes are applied the actuation mechanism contracts the attached brake shoes which in turn makes the frictional contact with the rotating disc rotor and causes the braking of the vehicle. It is the type of brakes in which the brakes are applied when the driver presses the brake pedal mounted inside the cockpit or at the foot space of the vehicle with his foot, this pedal force applied by the driver is further multiplied and sent to the braking drum or disc either by mechanical linkages or by hydraulic pressure which in turn causes braking. In cars foot operated brakes are used and in bikes the combination of foot and hand operated brakes are used. 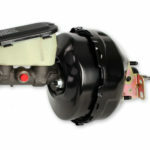 This type of brakes are also known as emergency brake as they are independent of the main service brake, hand brakes consists of a hand operated brake lever which is connected to the brake drum or disc rotor through the metallic cable. When hand brake lever is pulled, tension is created in the metallic rod which in turn actuates the brake drum or disc rotor mechanism and final braking occurs. Hand brakes are usually used for stable parking of the vehicle either on flat road or slope that is why it is also called parking brakes. Torque Converter Working, Principle, Main Parts and Application. 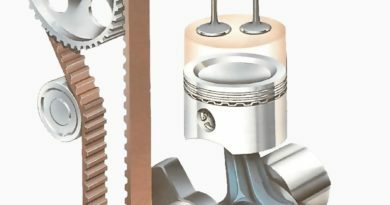 How DTSi Engine Works – Explained? It is the type of braking in which brake force is transferred to either a pair of wheels(in cars) or to the single wheel(in bikes) through single actuation mechanism(mechanical linkages or master cylinder). These types of braking system is commonly used in bikes or in light purpose vehicles. It is the type of braking in which the brake force is transferred to all the wheels of the vehicle through dual actuation mechanism (tandem master cylinder or mechanical linkages). This type of braking is used in cars as well as in heavy purpose vehicle. Mechanical brakes- Cars like Ford Model Y and bikes like Bajaj pulsar 180cc. Hydraulic brakes- Modern cars like Maruti Suzuki swift and bikes like KTM Duke 390. Magnetic brakes- Bugati veyron and various hyper cars. Electric braking- Tesla Model S Use regenerative type electric braking. 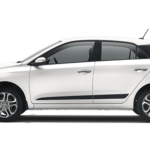 Disc brake- All modern cars like Hyundai i20. Hand brake and foot brake– All automobile vehicles. Single acting – TVS Appache 180 front disc. Dual acting- All 4 wheel cars and trucks. 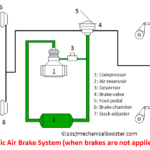 How Air Brake System Works in Automobile? ← What is Shock Absorber and How it Works? How Spark Ignition Engine Works?